Kona's iconic Wah Wah Pedals are now available in plastic. 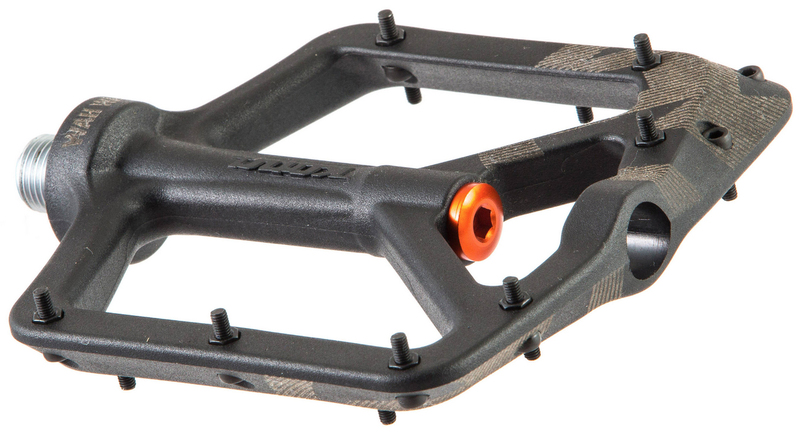 Featuring a super-sleek, thin profile, these pedals are excellent for a variety of riding styles and varying terrain. With 7 grippy pins on each side, they have an affinity for keeping your feet in place. The spindle features an anodized cap to keep the bearings running smooth. Comprised of a heavy duty plastic, they utilize a slightly twisted shape and concavity to prevent slippage. If you're looking for a strong, light plastic pedal, look no further than the Plastic Wah Wah. I am transitioning back to flats after a year on clipless pedals. An injury that could have been prevented prompted the switch. I wanted a pedal that was big and grippy. These fit the bill. I've got two rides on them and they are very confidence inspiring. I highly recommend! Don't get me wrong, I love Kona, I own one of their bikes. But I was disappointed by these pedals. One of the pedal bodies cracked near the spindle in about 4 months/200 miles of use. I subsequently found a review of these pedals where the reviewer experienced the same issue. This has never happened to me before, even with other composite pedals. Luckily JensonUSA is awesome and let me return them with no hassle, but I won't be buying another set of these. I was looking for a modern, larger sized platform pedal, with a low profile. At under $50, the Wah Wah 2 fit the bill precisely. I read a few online reviews (all very positive) and took a chance. I normally ride with platforms, so I'm a little particular when it comes to pedals. The Kona's don't disappoint. Great pin placement w/ a slightly concave setup, the giant inboard bearing sit's right by the crank arm and doesn't get in your way at all - and stiff - no flex at all. And, it's very lightweight - both are lighter than just ONE of my more burly aluminum platform pedals! Try em out, you'll love em! I have spent most of my time on a mountain bike on clipless pedals. I wanted to try flats, and these appealed to me because of the price and good reviews online. So far, I have really loved them. I have been wearing Nike running shoes and have been really impressed by how good my foot sticks to these. I have taken these out on 3 rides and have really abused them hard. Tons of really hard pedal strikes on rocks. I thought for sure that I would have broken them on a few of the strikes. Not a scratch. The only issue was that I needed to tighten 2 loose pegs. So far, I plan to ride these flats through all of 2018. I would give these 5 stars except the color is strange. 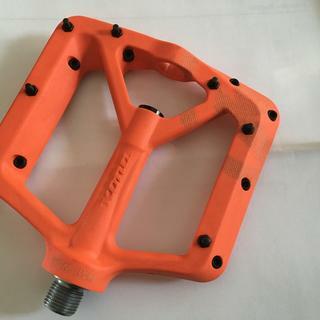 I ordered the orange pedals. When I opened the box they looked like the red ones. Then, when I took a picture to send to customer support to see if I got the right ones they looked orange on the iPad. On my bike, they look almost pink (or salmon). I'll attach a picture of the exact same pedal in the same room, same light, but on two different backgrounds, and on my bike. Great pedals for $50. pins are long and sharp, keep the feet in place really well. They are very good platform so fit my size 13 510 freeriders very well. Make sure you have some washers for installation. Great Grip pedal that fits Big feet. 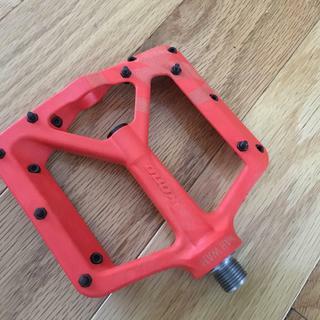 I wear a 11.5 fiveten freeride shoes, after reading some good reviews on this plastic pedal, I decided to give em a shot. 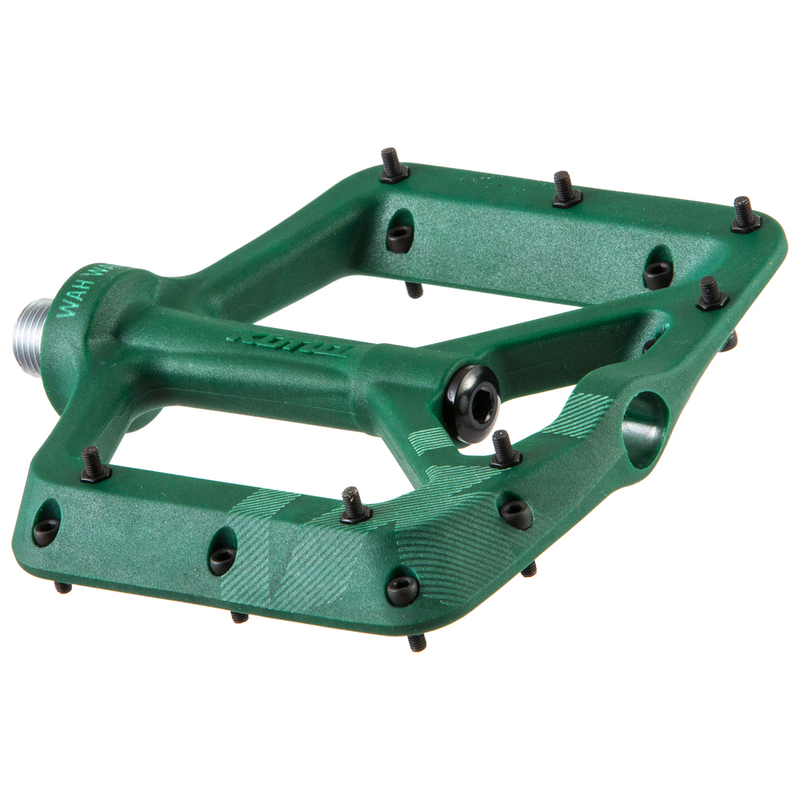 These pedals have grip for days, as good as my DMR Vault pedals. Looking at them, I could see they are very well made. As for performance, the reviews I read were not wrong, these pups rock. If you have big ole feets, give these pedals a try. Cost is a plus. Oh, and the Orange almost matches the logo on my bike. Pros: Burly built, easy install and rebuild able. Cons: Hmmm, none that I can think of.. The only thing better than buying these pedals is buying gorilla glue to stick your feet to less awesome pedals. These pedals look great and feel great! 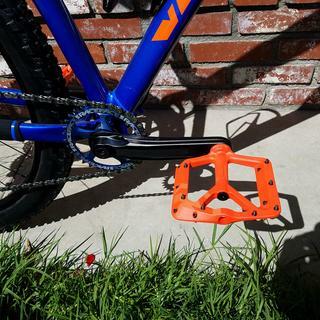 Great lightweight pedals. The grip is crazy good and I have had a few good pedal strikes and they still look brand new. Amazing pedals! I was worry about the composite material but it's super light and strong. Great price. 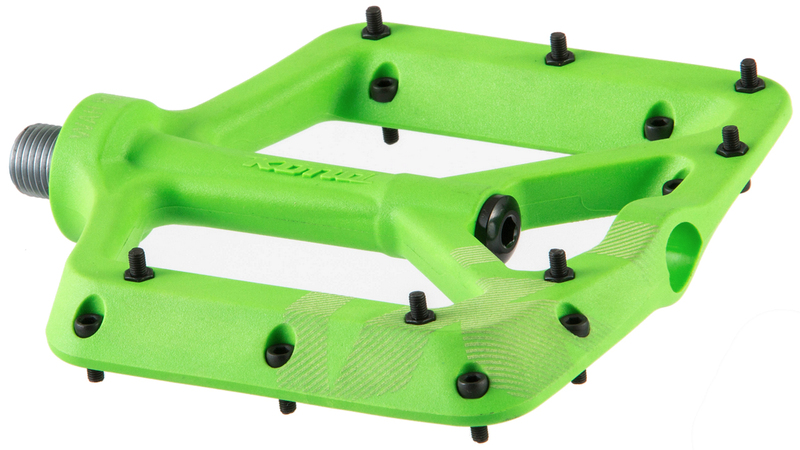 These pedals have been great, big wide grippy platform with just a little bit of concavity to add grip. No durability issues after they have hit rocks too. An even better pedal, light, strong, and tons of grip. I haven’t ridden flats in years and these are a re-introduction and I couldn’t be more pleased. I’m picky about pedals. Size 13US shoe, avg width. I’m comparing these pedals to VP Harrier (120 mm wide x 110 length) and the the Catalyst pedal (90mm wide x 143mm length). Both are great pedals but the Wah Wah’s are a best of both worlds. My feet feel supported by the length and are still wide enough since I tend to ride with my toes pointed outward. The pedals are still relatively light and and thin and have held well with occasional pedal strikes. The pins are grippy enough for me and I can reposition my feet without issue. Give them a shot if you are looking for a composite pedal, cause the price is great as well! I have big feet (size 13). I have a lot of pain in my feet, spds and cycling shoes have just been making it worse over the last few years. I searched for some nice large platforms and found these bad boys. I have very little pain when riding with these and my fiveten freeriders. The grip is phenominal, I ride these on my mountain bike and my road bike. Nice and light as well. They feel great underfoot. The grip is so good sometimes I try and unclip from my pedals thinking that I'm still on spds. The pins on these pedals are very aggressive. They protrude a long way from the pedal surface. I ride with a smooth soled FiveTen shoe and I’m considering trimming the screws or replacing them with shorter ones. They would probably be great with shoes that have a chunkier sole. I do like how they fit close to the crank. The hump where the bearing is makes a nice surface to nestle my foot against so I know I’ve got my foot in the right place. Haven’t ridden them long enough to comment on durability yet. Bought these because I like flat pedals that are super wide to fit my big feet. The pegs are super grippy and the platform conforms nicely under your feet. They have been super durable so far and dont form sharp edges like a lot of metal pedals!! Nice wide pedal. Can't beat the quality for the price. My feet tend to point out when I'm riding so these pedals are great at providing extra platform for that. Haven't noticed any significant issues with pedal strikes as a result. More options for replacing pins of variable lengths would be nice though. 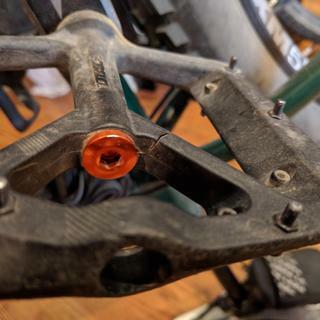 The only downsides are the lack of pins in the middle of the pedal, which gives them a little less grip than One Up’s composite pedal, and the round protruding thing that sits dead center on the outside of the pedal. It probably won’t matter format people, but I wear a size 13 shoe and unless I position my foot perfectly it winds up resting on that round circle thing. On descents that can lead to a pressure point and some discomfort. That said, if your feet are any smaller or you’re okay putting up with that and just getting your feet in the right spot (which I get better at with every ride) then these are excellent. These pedals are amazing, hard to describe other than they just "felt good". 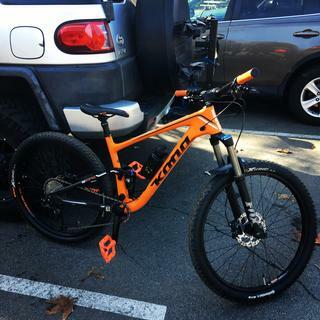 I moved them from my trail bike to my DH bike, to my dirt jumper. So why 2 starts? There reliability is TERRIBLE. They broke after only two months of use. My friend also broke his in half as well. Landing a serious huck to flat, the pedal snapped. He was lucky he didnt get hurt. I asked the guys at my local bike shop and they said they had "numerous" complaints and didnt recommend using these for anything other than "fat biking". Hope this helps! 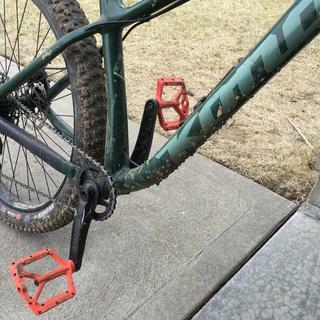 Had these for only a month a so riding them on XC trails and one pedal is already bent (have no idea how) and pins break off easily from a rock strike. Good platform but I don't recommend. For the 15 minutes that i rode on these pedals it was awesome. Tons of grip, even toned down the spikes a little bit. After riding for a bit I decided to hit a jump, when I landed off the first jump I hit with these pedals they cracked in half. This caused my foot to slide off and i crashed. Not a fun experience. 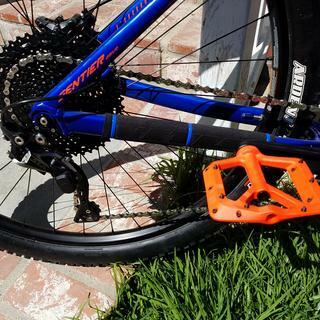 Great flat pedals with large footprint. These pedals bring a strong rhythmic groove of a bass line. Like much of African-inspired music, these Kona Wah Wah pedals consist of a complex rhythm with interlocking grooves. These pedals also use the same richly colored extended chords found in bebop jazz. How much do these pedals weight? 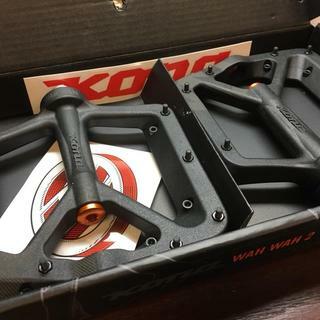 BEST ANSWER: I just checked Kona's web site for the Wha Wha II composite pedals, and apparently they are discontinued, as you can not buy them, even from Kona..And yes they haven't been out very long. I'm baffled as t o why they stopped making them. I bought this pedals in January and I think that it is weird for them to discontinued them. I will check the manufacturer website to be sure! There must have been quality issues because I had a pair break on me after a few months of light use. Bummer too because I really liked them. What are the dimensions of these pedals? BEST ANSWER: 4 5/8 in. from toe to heel and 3 5/8 in. width of the actual platform area. are the pins replaceable on these pedals? Yep but it doesn’t come with any extras. Are these the Wah wah II pedals..? BEST ANSWER: Yes, they are the composite II's. 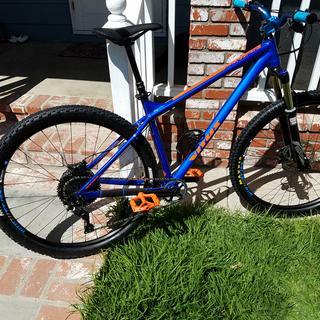 Will it fit an XO cranks with crank boots?